I have had to put off this week’s Girl Scout Cookie adaption off until tomorrow. I somehow ran out of a GF flour, so tomorrow I will post the next cookie (trefoils – squee!!). That means Hot Chocolate Cupcakes will be posted on Sunday. It seems like everyone on the web is gearing up for game day snacks. For my post on this, see “game day snacky ideas” for some gluten and dairy free inspiration. For something else you can make for game day, try Crunchy Chickpeas. They are super easy to make and make an interesting tasty snack for your game day table. Preheat oven to 450 degrees F. Pat dry chickpeas with lint-free clean dish towel or paper towels. Put chickpeas on a rimmed baking dish. Drizzle chickpeas with olive oil. Toss chickpeas to coat evenly. Spread chickpeas evenly on baking sheet into a single layer. 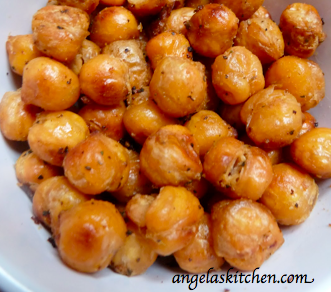 Bake for 30 to 45 minutes, stirring avery 15 minutes until chickpeas are beep golden brown and crispy. Sprinkle chickpeas with salt and paprika. Toss around to evenly coat with spices. Allow to roast for 3 more minutes. Remove baking pan from oven and allow to cool completely. Freeze in an airtight container until ready to serve. You can also freeze in snack sized portions. Label and freeze. To serve: Allow chickpeas to thaw to room temperature and serve. this is totally unrelated to this post, but for the love of all things sacred and holy, PLEASE TELL ME WHAT THE LITTLE GLORIOUS LOOKING BALLS WITH WHITE FROSTING IS at the top of the website! if I don't find out, I will jump!!! love your site, thanks for so many yummy recipes!